A fast start and a spurt at the end of the first half helped Warsaw take command on the way to a Northern Lakes Conference victory over NorthWood at the Tiger Den Friday night. The Tigers opened the game 16-4, only to see Northwood tie the score at 22. They regrouped to and finish the first half on a 9-2 run to go into the half leading 31-24. The second half was evenly played up to the final four minutes, when the Orange and Black outscored the Panthers 13-6 to finish with the 14-point margin. Nolan Groninger led all players in scoring with 20 points. He also led the Tigers in assists with five and rebounds with four. Making the most of his first varsity start, Luke Adamiec tallied 13 points and pulled down four rebounds. Trevor Rumple and Wyatt Amiss added nine and seven points, respectively, while Blake Marsh chipped in six points, four rebounds and three of the Tigers’ 11 steals for the game. Warsaw (10-4) remained unbeaten in NLC play at 5-0. 6-8), which dropped to 2-3 in the conference. Warsaw heads up to North Side gym to play the Elkhart Central Blue Blazers on Saturday. NorthWood returns home to host Concord Thursday. A 36-15 second half made the difference as Wawasee dropped an NLC game with Concord at the Hardwood Teepee Friday. The Warriors led 33-29 at the half but couldn’t hold on as they scored just 5-of-19 (26 percent) buckets in the second half. Austin Miller poured in 24 points, and Ben Hoffert finished with 10 points and four assists for the Warriors. Concord got a game-high 33 points with six rebounds and four assists from Michael Johnson as the Minutemen scored at a 26-of-38 (68 percent) clip on the way to the win, which snapped a three-game losing streak. Concord improves to 3-10 overall and 2-3 in the NLC. Wawasee drops to 3-11 overall and remains winless in NLC play at 0-5 following the loss, the team’s fifth straight. Wawasee’s JV won, 48-41, Friday. The Warriors play at Lakeland Saturday. Valley suffered its second straight Three Rivers Conference loss at Manchester Friday night. 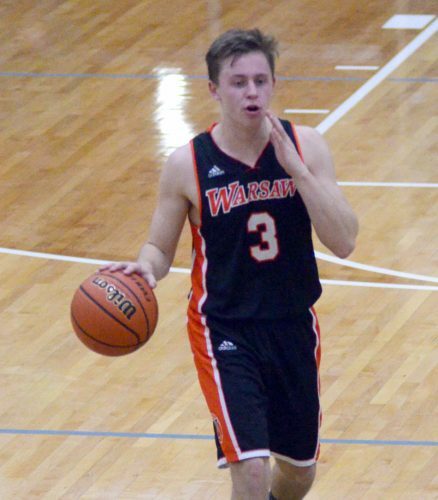 Weston Hamby scored 21 points with five assists and four rebounds, and Than Creager put up 19 points in a good one-two punch for the Squires, who moved to 9-6 overall and 4-1 in TRC play with their fourth straight win. Valley was led in scoring by Cam Parker’s 12 points. The Vikings dipped to 7-8 overall and 4-2 in the conference. They play host to Clinton Christian Saturday. Triton’s girls basketball team closed out the regular season with a disappointingly lopsided loss to North Judson-San Pierre at the Trojan Trench Friday night. The Lady Trojans converted just 25 percent of their shots from the floor, making only five field goals while turning the ball over 23 times. Jaela Faulkner scored five points, and Lexia Hostrawser and Alyxa Viers each scored four for the Lady Trojans. Lilliann Frasure finished with 18 points, and Madline Schumacher scored 15 for Judson, which scored 33 points off Triton’s turnovers. The Lady Jays finish the regular season at 18-3 overall and close Hoosier North Athletic Conference play at 6-0. Triton finishes its HNAC slate at 4-3, meanwhile, and dropped to 6-10 overall. The Trojans enter Class A Sectional 51 play opposite South Central Tuesday at Oregon-Davis.